The Assignment: Follow a single strand in the accumulated material resulting from a multi-part, multi-thread collaborative endeavor. Deadline: This project’s deadline is Monday, February 4, 2019, at 11:59pm (that is, just before midnight) wherever you are on. It was posted in the afternoon, California time, on Thursday, January 31, 2019. Major thanks to Alan Bland for having reworked the source imagery for this project. Step 2: The next step is to find a “through line” amid the accumulated audio. It can help to work backward from a final trio (project 0369), and to then listen to the duo that led to it, and to see if another trio was created from that same duo — and to then go back further to the left channel’s solo rendering in the first project, and see if any alternate duos were created from it. In other words: locate a single original solo piece of music in however many subsequent pieces as possible. Step 4: Listen to the various pieces of music that resulted from the search in step 2. There may be as few as three, but there may be more than that. Step 5: Construct a single piece of music that follows that one “through line” amid its various contexts (solo, duo and possible alternate duos, trio and possible alternate trios). Do not add audio to the source audio tracks at all; filtering and processing is fine. 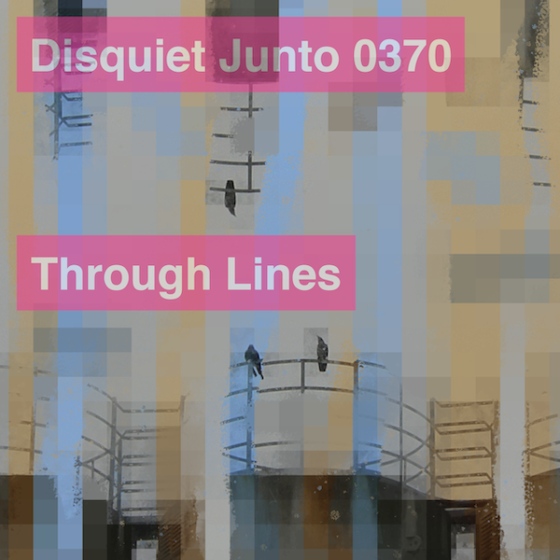 Step 1: Include “disquiet0370” (no spaces or quotation marks) in the name of your track. Step 2: If your audio-hosting platform allows for tags, be sure to also include the project tag “disquiet0370” (no spaces or quotation marks). If you’re posting on SoundCloud in particular, this is essential to subsequent location of tracks for the creation a project playlist. Title/Tag: When posting your track, please include “disquiet0370” in the title of the track, and where applicable (on SoundCloud, for example) as a tag. Image associated with this project is adapted (edited, color altered, text added) from a photo by Anna J and is used via Flickr thanks to a Creative Commons license. Many thanks to Alan Bland for having done the reworking of this image, based on visual source material from the previous three projects.